In different location of Narsingdi district there are a number of Archaeological sites which attract traveler and explorer to visit these places recurrently. 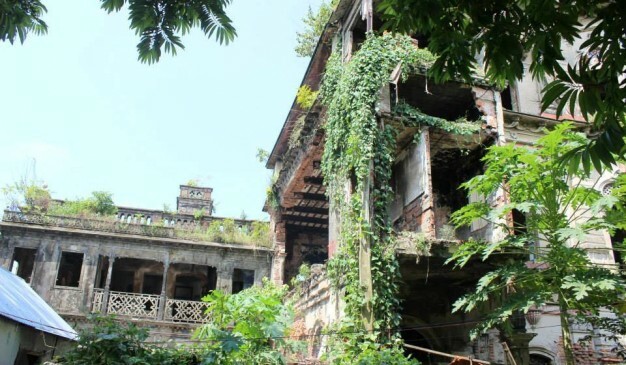 Balapur Zamindar House (বালাপুর জমিদার বাড়ি) is one of the old palatial buildings in this district. 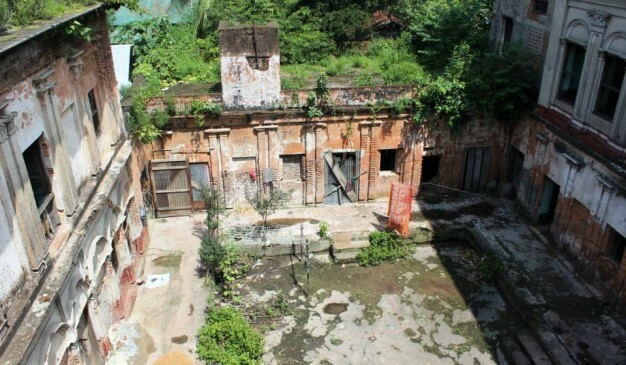 If someone interested to visit the oldest buried civilization area in Bangladesh named as Wari-Bateshwar, then it would be better to take a glance at Balapur Zamindar House while moving there. It’s situated at Balapur village, Madhabdi Upazila of Narsingdi district. 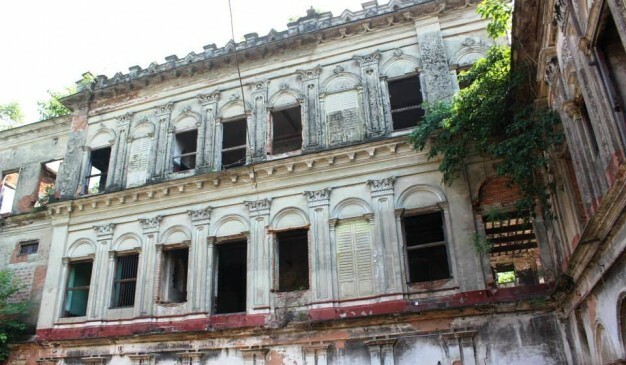 This Zamindar House was built by local Zamindar named ‘Nobin Chandra Saha’ in 1906. It is also known as Zamindar Kali Babur Bari (কালী বাবুর বাড়ি). It’s a complex of buildings scattered in a particular zone. Basically, most of the buildings are three storied and some are one or two storied. Dept. of Archaeology in Bangladesh doesn’t announced it as a protected site yet. 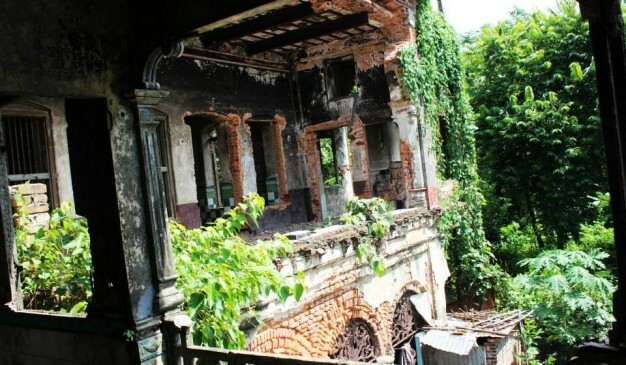 So like many others old houses in Bangladesh it is on the way of ruining. 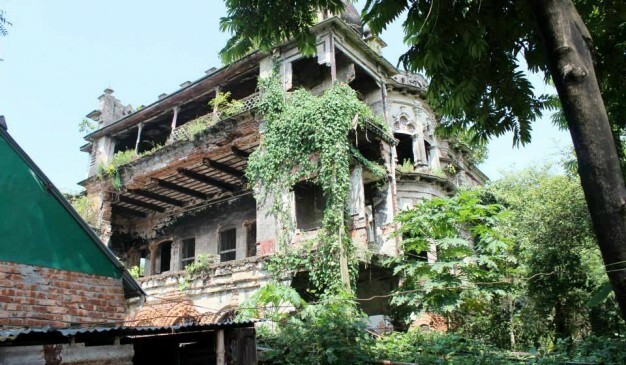 No matter how decorative and ornamented this house is, it’s almost abandoned and some people who living in this house are so called ancestor of Zamindari estate at Balapur. Some local people are selling all the floor tiles made by white stone desperately. But, Still today this beautiful palace standing with its own identity and spreading the essence of colonial palatial architecture in Bengal. If proper steps being taken this structure can be preserved & conserved for the future exhibiotion. It’s a easy going track from Madhabdi bus stop. Once you are there at the bus stand then you will find several options in your hand to reach at the Balapur Village. You may ride on a shared CNG auto rickshaw or Rickshaw to reach at Balapur Bazar via Balapur-Meghna bazar road. The communication system of this district is very good. The Dhaka-Sylhet highway, one of the important highways of Bangladesh, passes through Narsingdi. It is only 1/2 hours distance from Dhaka. Inter-district road communication is also better from here. Water way communication is also very good as lots of river flows through Narsingdi. Dhaka-Chittagong and Dhaka-Sylhet, two most busiest rail route of the country goes through Narsingdi. People can easily go Narshingdi by boarding this buses. From Gulistan -Meghalay Luxury, from Sydabad & Gulistan bus terminal – Monohordi Paribahan, Anna Super Service, BRTC Bus. From Mohakhali Bus stand – PPL, Chalan Bil Transport, Arabian Transport, Badsha Paribahan. Address: BRTC Bus Depo, Kamlapur, Dhaka. 3. Badsha Paribahan (Pvt.) ltd. The transportation between Dhaka City and Narsingdi district is quite fair. The distance from Dhaka city to Narsingdi dictrict is around 59.4 km. In train, it would take around 1 and half an hour to travel to Narsingdi from Capital city. It has 10 train stations inside the district. Trains, travelling to Sylhet and Chittagong and only developed train, like Mahanagar usually stop in the Narsingdi rail stations. Where as Titash commuter and Egarsindhur stops in different stations in Narsingdi. Once you are determined to pay a visit in Narsingdi District you will find a significant number of options for wondering around. 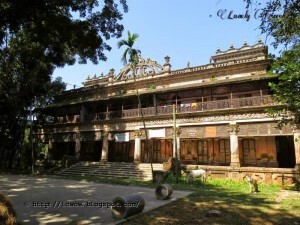 We would rather suggest you to follow the link- http://www.offroadbangladesh.com/aplaces/places-visit-narsingdi-district and help yourself to make an Itinerary. If you are very unfamiliar with making itinerary then you may contact us. You will find local restaurants and hotels nearby the Balapur Bazar. If your demand is something more than local cuisine, then you may find out a hotel or restaurant at Madhabdi bus stand. 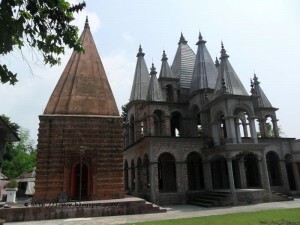 Temple of Motto or Motter Moth (মত্তের মঠ) is located at the village Motto (মত্ত) of Manikganj Sadar Upazila. It is situated at the eastern side of Manikganj (মানিকগঞ্জ) town. This Moth is about 50-60 feet tall, looks like a Shiva temple. Currently this Moth is abandoned, located beside a pond. A new temple is built near the old one. It is not sure who built that moth or its actual time period. 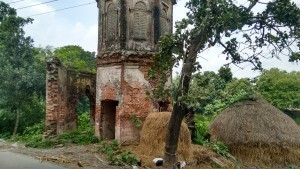 People says that a prominent Zamindar Ram Krishna Sen (জমিদার রামকৃষ্ণ সেন) lived at Motto Village. Possibly he could built this temple. From the close observation, it is assumed that this Moth could be around 100 years of old, or may be less. 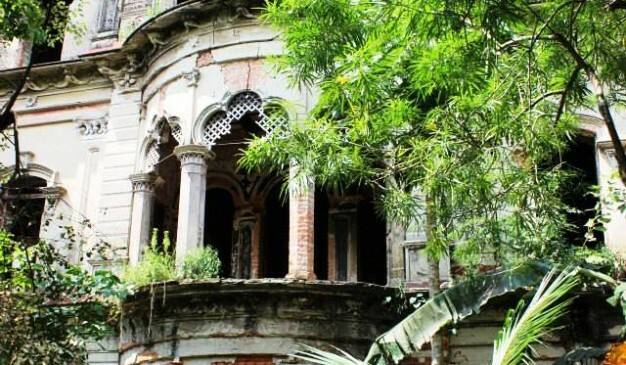 Pakutia Zamindar Bari resides under the administration of Nagarpur of Tangail district. 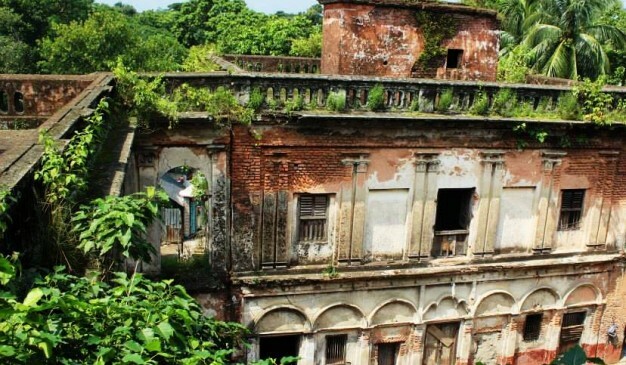 This Zamindar Bari complex comprises of three main buildings. Out of these three, one is much larger compared to other two’s. The larger one is using as a Degree college these days and also the college authority holds the ownership of other two edifices as well. But they have rented Pakutia Zamindar Bari to other organization. Initially the Zamindari was established by the hand of Ramkrishna Shaha Mondol at the early of 19th century. He has two sons named Radha Gobinda and Brindaban Chandra. Radha Gobinda didn't have any children but Brindaban Chandra had three. They are Brojendro Mohon, Upendra Mohon and Jogendra Mohon. Childless Radha Gobinda adopted the second son of his brother and later gave his whole property to him. These three brothers later built three separate buildings for them in 1915 (almost 100 years from now). 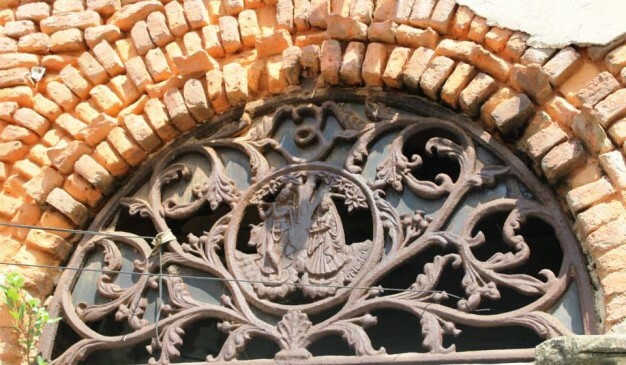 Each of the buildings are having extreme artwork & design, stylish columns, and small statues. Each inches of the building is having a delicate design that impresses everyone even these days. Top of the building is having a lovely sculpture type architecture that is rich in design, concept, and artwork (more if I consider the building period) in this modern days. Apart from these, there are several large ponds located at the backyard of the building. This Zamindar family was friendly towards the villagers. They have established a school during 1916 named as Brindaban Chandra Radha Gobinda School (in short B.C.R.G. School) for their father and uncle. They have left this country during the 1947 separation. Later in 1967, the government established B.C.R.G Degree College on these buildings to commemorate the friendly Zamindar family. 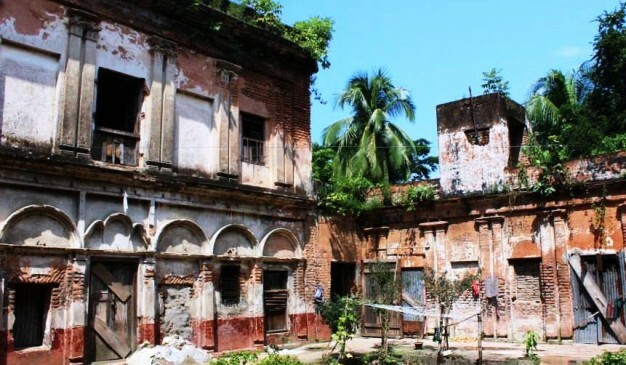 Apart from the Zamindar Bari, the premise now has a temple which probably used by the families who lived here. Also there is an open theater available that was used to arrange the local play or drama known as Jatra/Pala (যাত্রা/পালা). Handial Jagannath Temple (হান্ডিয়াল জগন্নাথ মন্দির) is an old temple located at Handial (হান্ডিয়াল) village of Chatmohor Upazila of Pabna district. As it is located at the Handial village, it is known as Handial Mandir too. 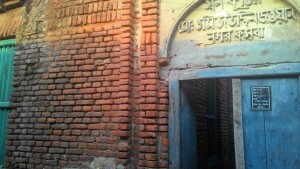 It is a single door small sized temple which was built using bricks. This temple gets narrower as it is progressing upwards. Only the front wall of the temple has some terracotta. The temple is placed over a high plinth. From the inscription, it is found that the temple was reconstructed by someone named Bhobani Proshad during 1590. But scholars are assuming that the temple was built even another 100 years before from that time. The whole temple premise is under a boundary. Another two newly temples are being constructed at the both side of the old temple. There is a small chariot (রথ) available inside the premise. Also, a Mondop (মন্ডপ) is available for the upcoming Hindu festival Durga Puja (দূর্গা পূজা).